These easy-to-make apple cupcakes are a fun back to school treat that the kids and teachers will enjoy on the first day of school. It seems like summer just began, yet somehow back to school season is already upon us. Some kids are always excited to get back to school, but others… well, not so much. 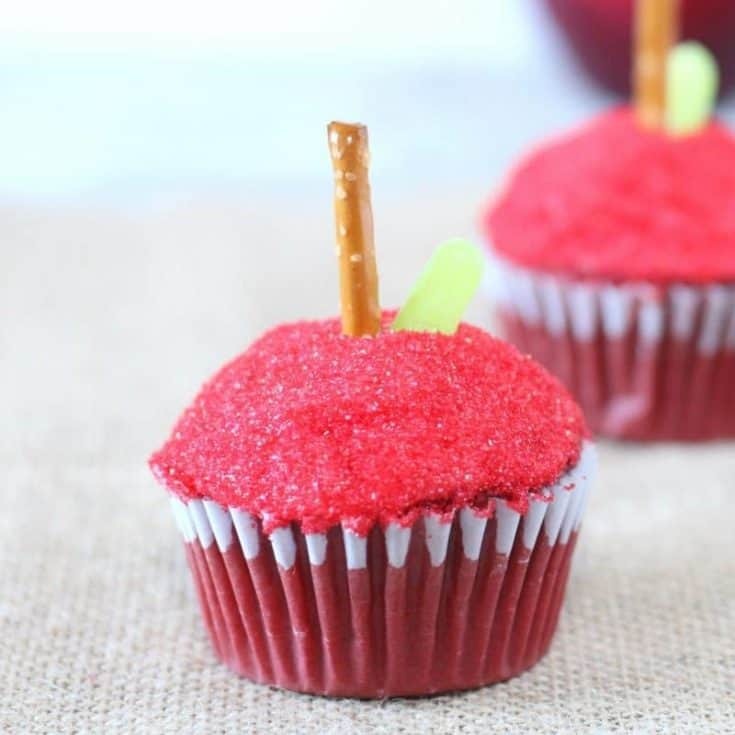 Who knows… maybe whipping up a batch of these cute apple cupcakes will help to get the kids in the back to school spirit. 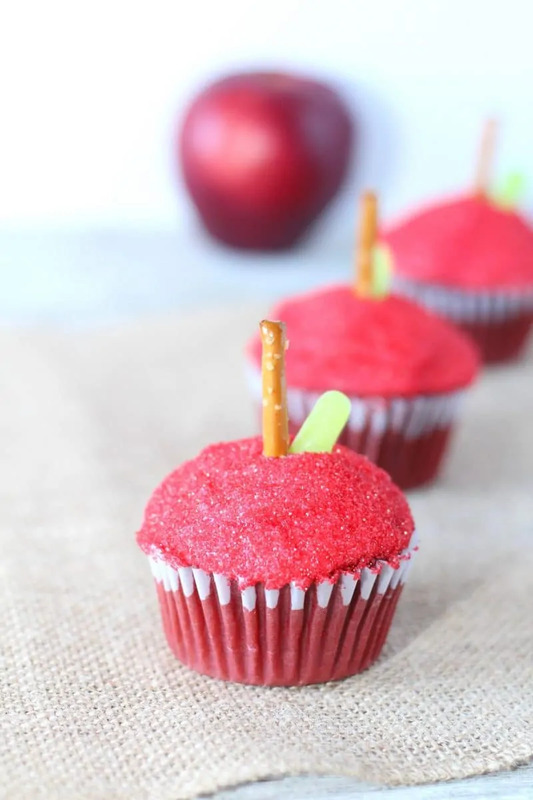 Either way, one thing that the kids are sure to love are these adorable apple-shaped cupcakes. So grab the little ones, head into the kitchen, and whip up a batch. They are super simple to make, and the kids will love to help sticking the pretzels and green candies on top. The whole family will love these fun back to school cupcakes. 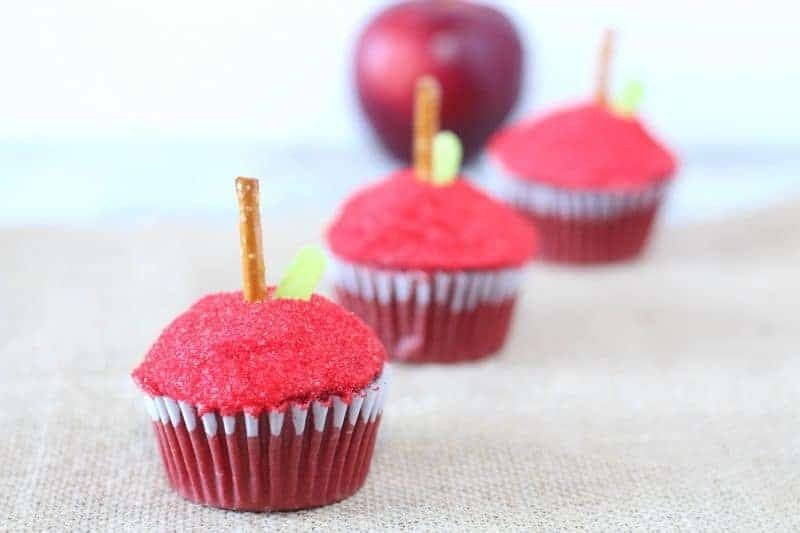 These apple cupcakes can double as teacher appreciation day cupcakes too. A tray of these fun apple-shaped cupcakes in the teacher's lounge is sure to make every teacher's day a little bit brighter! 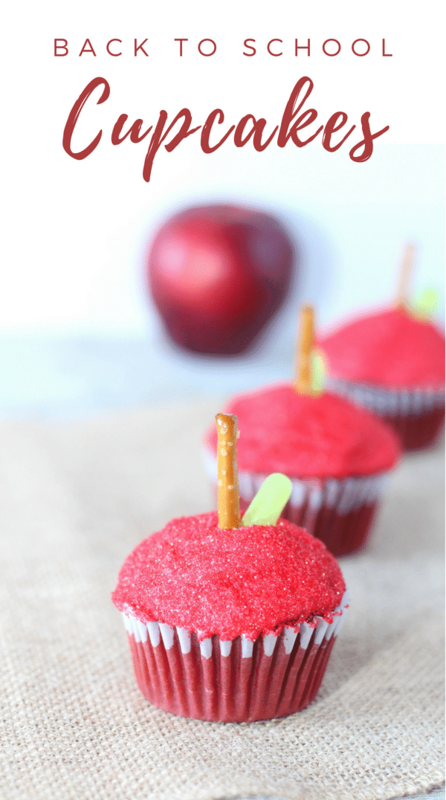 Apple cupcakes are an easy-to-make back to school treat perfect for the first day of school. Prepare cupcakes according to instructions on box and allow to cool. Cover each cupcake with white frosting. 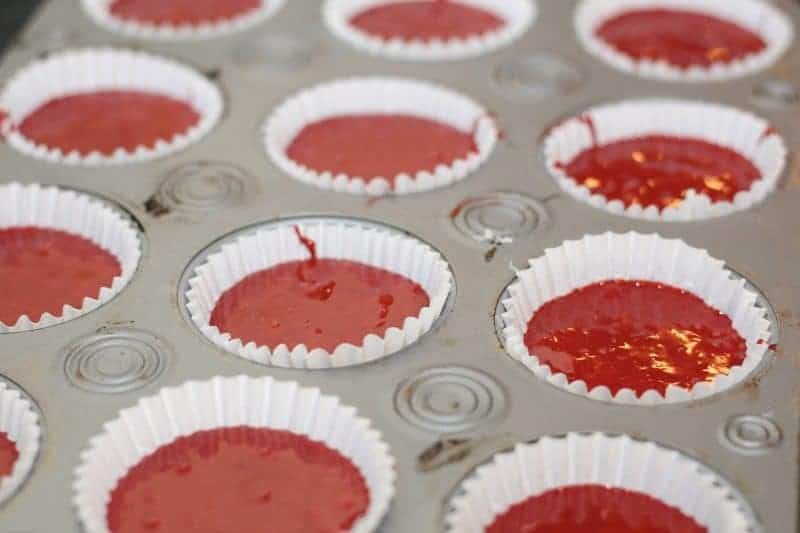 Roll the top of each cupcake in red sugar sprinkles, until the icing is completely covered. 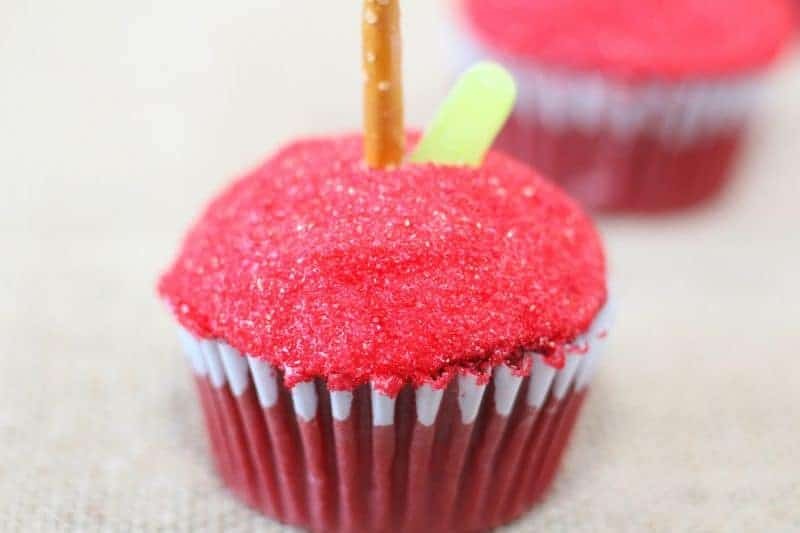 Place a pretzel stick into the center of each cupcake. Place a green Mike and Ike candy next to each pretzel. If your kids aren't too keen on red velvet, feel free to use vanilla cake mix instead. Just add a few drops of red food coloring to the mix before baking. These cupcakes are too cute! Perfect for back to school. These are so cute! What a fun, creative, back-to-school idea. What vibrant looking cupcakes! They would be great for a birthday party! Love these! Will definitely be making these for my son’s teachers! Yummm! And so adorable too! These are so cute, and look easy enough that even I could do it. LOL. Those are so cute! I am going to have to try those! Thanks for sharing!